Senior middle blocker Alex Ronnebaum (14) manuevers a shot around Legacy Christian defenders Meriya Angel (8) and Layne Burke (10) during a Metro Buckeye Conference girls high school volleyball match, Aug. 27 at Yellow Springs High. The host Bulldogs won the match in straight sets. Legacy Christian’s Maria Uszynski bumps the ball to a teammate during Monday’s girls high school volleyball match against host Yellow Springs. Bulldogs Angelina Smith (6) and Emma Ronnebaum (16) contest the Legacy Christian shot by Maria Uszynski, during Metro Buckeye League girls volleyball play, Aug. 27, at Yellow Springs High School. Yellow Springs’ Tyler Linkhart (10) hits over the block of Legacy Christian players Meriya Angel (8) and Renee Fear, in Monday’s high school girls volleyball match. The host Bulldogs won the match 25-10, 25-10, 25-20. 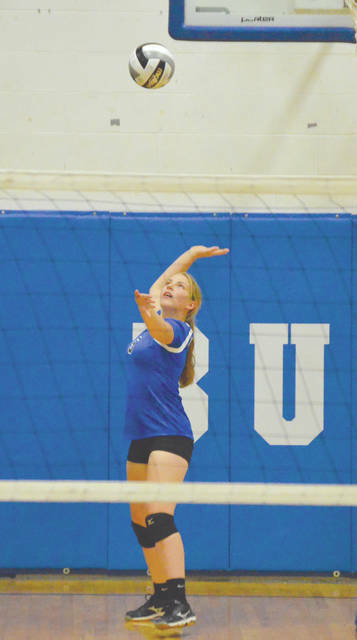 Junior Olivia Snoddy of Yellow Springs gets ready to strike at a serve, during a Metro Buckeye League girls high school volleyball match against visiting Legacy Christian, Aug. 27 in Yellow Springs. The Knights’ Rylanne Burdette keeps the ball in play for Legacy Christian, during Monday’s high school volleyball match against host Yellow Springs. 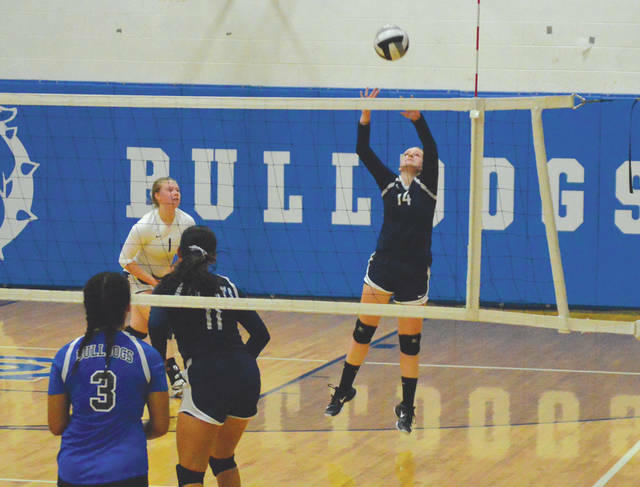 YELLOW SPRINGS — Playing in mid-season form, the host Yellow Springs High School Bulldogs swept Metro Buckeye League foe Legacy Christian in straight sets, Aug. 27 in a girls high school volleyball match. 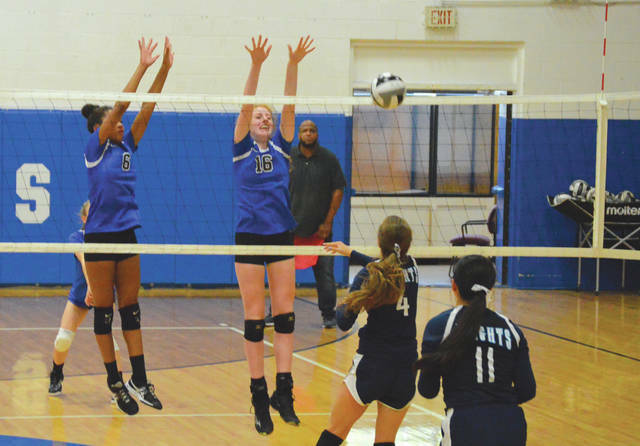 Behind the solid serving of sophomore Annlyn Foster (five aces) and a trio of heavy hitters, Yellow Springs remained undefeated this season with a 25-10, 25-10, 25-20 home win. Sisters Alex and Emma Ronnebaum teamed up with Tyler Linkhart to record 15 kills, three blocks and four more ace serves to lead the Bulldogs. Coach Christine Linkhart said Monday’s win was one of the team’s best so far. That comfort factor at times made Legacy’s front line appear uncomfortable. 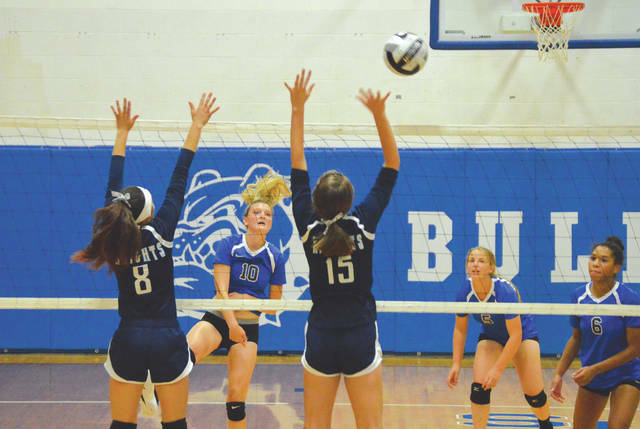 Without breaking out the tape measure, the Ronnebaum sisters and Tyler Linkhart appeared to be the tallest players on the court. 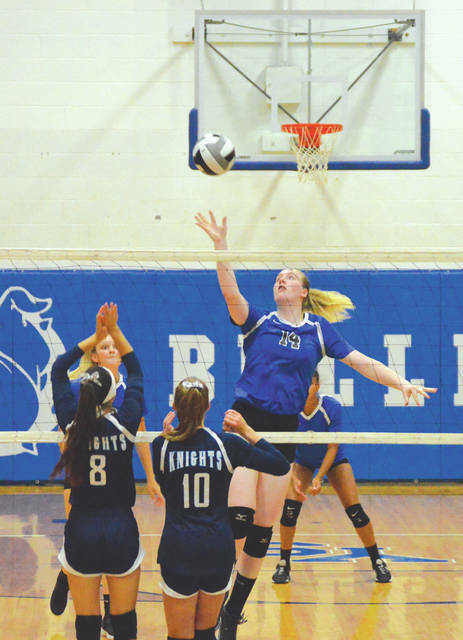 That height advantage often left Knights hitters with the option of hitting high arching shots to the back court, or watching their low angled shots meet a wall of tall Bulldogs at the net. After LCA grabbed the first point of the match, on a Meriya Angel kill from the left side, Alex Ronnebaum recorded her first kill of the evening to even the game and give serve to the Bulldogs’ top server, Foster. The Yellow Springs sophomore recorded her first ace of the evening. That, combined with a well-place bump score by Aaliyah Longshaw and a crushing leftside kill from Alex Ronnebaum, gave the ‘Dogs a 5-2 lead that the team never relinquished. Yellow Springs rolled to a 25-10 win in the opening set. The Bulldogs never trailed in the second set, winning against by a 25-10 margin. For a lot of teams, two convincing loses might demoralize the team. But it seemed to make coach Amy Pickens’ Knights want to play even harder. After falling behind early in the third set, the Knights tied things up at 2- and 6-all before taking the lead on Kaitlyn Crawford’s ace serve. A pair of Bulldog miscues gave LCA a 10-8 lead, but that’s when Yellow Springs clawed its way back in front. Emma Ronnebaum took over with two blocks and a kill to give Yellow Springs the lead for good at 12-11. The Bulldogs never trailed again. Unofficially, Fear led the Knights with three kills. Libero Savannah Surls had a kill, and two bump-set winners to go along with a pair of service aces. Sammie Lomelin had two kills and Maria Uszynski recorded an ace and a kill for LCA (0-3, 0-2 MBC). Yellow Springs is now 4-0 overall this season, and 2-0 in the conference. 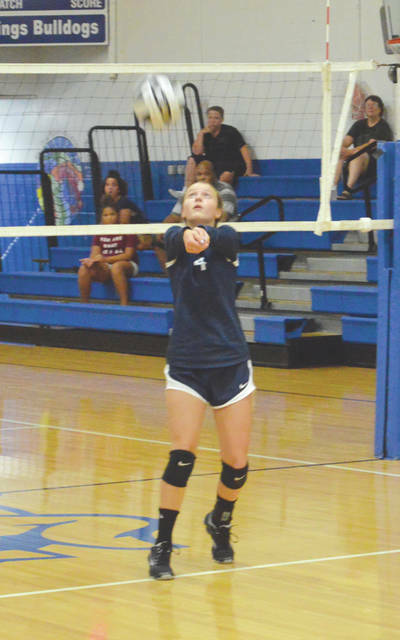 They’ll be back in MBC action for a home match with Middletown Christian at 7 p.m., Thursday, Aug. 30. Legacy Christian has a nonleague home contest up next. They’ll take on Stivers at 6 p.m. on Friday, Aug. 31.